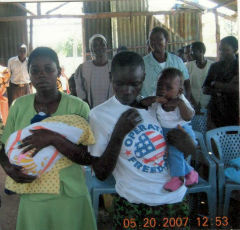 For many years the church in Kisumu has had to deal with poor families and children. This was compounded by the post election violence in 2008 as many people in the community and the church were killed or ran away and never returned. Currently there are around 20 children being assisted with education costs. This is a large burden for the church. Part of the solution to this is to empower a few women and to start up a small business where they can sell embroidery products and food items. 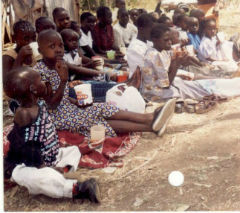 1) To subsidise the education of the 20 children. 2) To set up a small business for eight vulnerable women who have been trained in embroidery. They will make and sell products and also sell small quantities of food. 3) To set up a chicken rearing project. 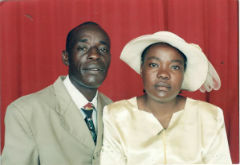 The purpose of this would be to assist the poorest of the poor that are coming into the church. We have remained in contact and during a visit to Kenya in 2016 Pastor Bob alerted us to the needs in this community. In May 2017 funds were provided to commence the embroidery business. Initially the eight women and their families will benefit with another income source in the home. As their incomes are increased and they are able to send their children to school then these children will benefit from getting a better education. They will be able to attend school regularly and have the basic equipment they need to attend. The church and Pastor Bob will also benefit as some of the financial burden will be lifted. We know Bob and Lillian and have been in partnership with them previously (KEN05). Lillian has run a successful partnership in the past. This is a church based programme and we will be assisting the church as a bi-product of the partnership. This is a very evangelistic church and is reaching out constantly. The vision is to see vulnerable families in the church empowered economically so they can become self-sustaining. The idea is that in the future the children will become economically self-sustaining because they have an education. Along with that, the business will be operating well and providing for the families of those involved. The second phase will see the establishment of a chicken project to generate funds so more of the economic load on the church because of poverty can be lifted. The budget for 2017 is US$774 and this will fund a small business for eight vulnerable women who have been taught to embroider by Lillian. The funds will cover the purchase of tables, sewing material and equipment, and some other food items to sell in the shop. This is a one-off amount. Farijah comes from a Muslim background. He was thrown out with his mother who is a Christian after the death of her husband. He came to Bob and Lillian's home fellowship with his sickly mother. He was very dirty and Bob remembers fighting back tears as Lillian gave him bath, wondering how anyone could let a child get so filthy. Farijah was constantly tired and hungry. His biggest need was the need to know that someone loved him and that God loved him. Today he loves the Lord and goes to school. Auma lost her sickly husband who left her with four children. Bob and Lillian met her during their rural evangelism and led her to the Lord. She is lame and weak and has nobody to help her raise her children. She is encouraged with a small business selling vegetables and the help she received to put up a small tin house to live in.